Hello beautiful faces! It's Wednesday! I double-checked to make sure it was really #BarefacedWednesdays! 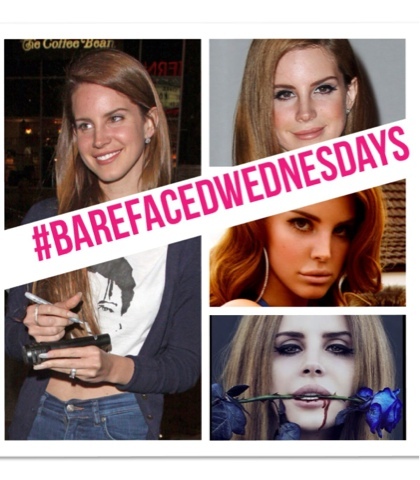 Today's' sans makeup muse is @lanadelrey! I've been obsessed with her since I first heard her hauntingly beautiful voice a couple years back. She had me transfixed the first time I heard her sing about a man in blue jeans and a white shirt (I was, at the time, in love with my boyfriend, now hubby, whose daily uniform was exactly that). Without makeup #LanaDelRey is so gorgeous though! I mean she's super, super cute! I just love her easy-vintage style, her blinged-out tooth, her long red hair, and her genuine feminine charm. Which look do you prefer? #nomakeup or #glam?